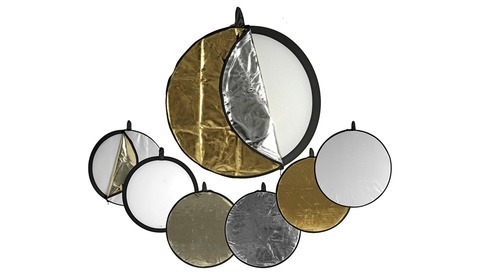 Many of us own a five-in-one reflector of some sort, as they're cheap, versatile, and effective instruments. However, they're commonly misused, and this great video will help you learn to use them effectively to get the best results. Coming to you from David Bergman of Adorama TV, this helpful video talks about the proper way to use reflectors. Both studio and natural light photographers frequently use reflectors to either kick back a bit of light to bring up shadows or even as a key light if they're working outside. The mistake I very commonly see is a photographer using the silver or gold side of the reflector and leaning it against their knees or having the subject hold it. This often ends up kicking too much light back onto the subject and lighting them from underneath, creating a bit of a horror movie effect. Rather, as Bergman details, one should think about the reflector as its own light source and position it the way you would a normal light. If you want to fill in shadows a bit, consider using the white diffuser panel for a subtler and more pleasing effect. It can change from situation to situation, so watch the light on your subject's face carefully. Give the video above a watch for the full rundown. I would use a black reflector to one side of the example photo do darken one side of the face and then use the diffusion reflector on top to get rid of the patchy sun on the face and then with flash fill or another reflector from the opposite side of the black panel to softly light the face. The 45 degree angle only comes into play when the panel is held so closely to the face in the video its showing the intent of the video though.